Historical and archaeological specialist with over 20 years’ experience of working in the heritage sector in Bristol, Pete is currently Principal Historic Environment Officer for Bristol City Council and maintains Bristol’s Historic Environment Record. Pete devised and manages Know Your Place and now advises on its various developments such as Know Your Place West of England and Bristol University’s Know Your Bristol projects. Pete is also a research associate at the University of Bristol History Department. Nourse, Insole and Warren, ‘Having a lovely time: localized crowdsourcing to create a 1900s street view of Bristol from a digitized postcard collection’. Participatory Heritage, Forthcoming. ‘Crowdsourcing the Story of Bristol’, Forthcoming. Nourse and Insole, ‘Shirehampton Remount Depot’, Bristol and Avon Archaeological Society Journal, forthcoming. Piccini and Insole, ‘Your Place or Mine? 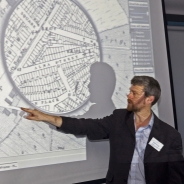 Crowdsourced Planning, Moving Image Archives and Community Archaeology’. Archäologische Informationen, 2013. ‘Using the Historic Environment Record for Cross-curricular Local Learning’ in Sites and Monuments Record to Historic Environment Record: Local Authority Case studies, English Heritage, 2010.